Historically, the Kuba people have used their cloths as skirts, wrappers, sleeping mats and even currency. 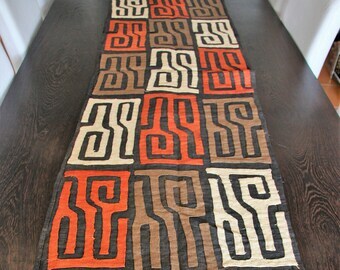 For textile enthusiasts, Kuba cloths make wonderful wall hangings. Each cloth is a unique creation made of.Raffia Palm Fibers. Piece is authentic and acquired in Kinshasa. The art of the Kuba of Zaire, which ranges from pipes to cups, metal to weapons, basketry to furniture to textiles, is remarkable for its abstract patterning. Traditional appliquéd cloth was primarily made into dance skirts. Skirts and embroidered Kuba textiles were produced and used for ceremonial occasions and court rituals. Until it was replaced by cowry shells, the basic Kuba weaving unit, an undecorated square of plain cloth, the mbal, was used as currency. 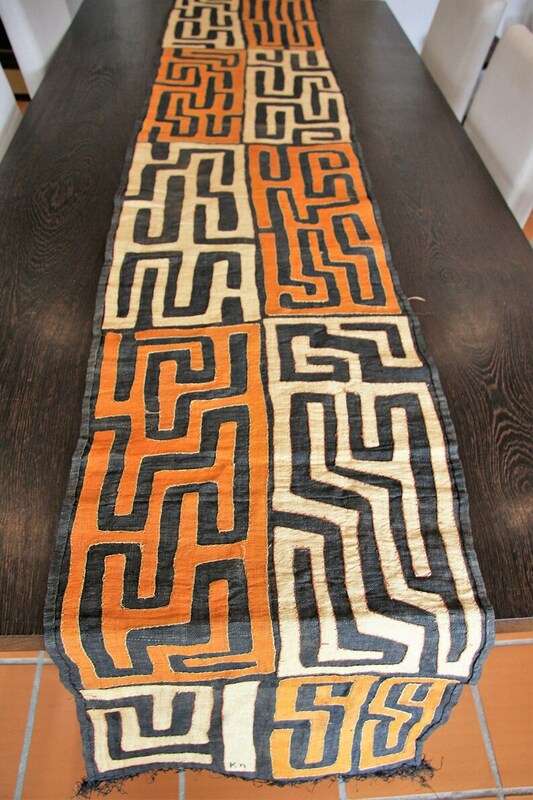 Kuba cloth is woven from raffia palm leaves. Production of the fine decorative textile is a series of endeavours engaging both men and women. The men are responsible for the growing, tending, harvesting and weaving of the cloth. The women are responsible for preparing it for decoration by pounding the stiff, rough cloth in a large wooden mortar until softened, for hemming and in some cases, treatment with brown, wine-red, black blue or yellow dye from local plant sources. The women create the cut pile embroidered panels as well. The men's dancing skirts are significantly longer than that of the womens, sometimes having distinct borders with fringe and raffia bobbles. The womens skirts up to nine yards in length, would be wound around the body several times and folded over a belt. Some of the decorative techniques incorporated by both men and women are appliquéd and reverse appliquéd, dyeing, tie-dyeing and resisted-dyeing, certain types of embroidery as well as patchwork. 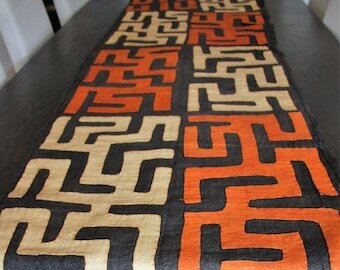 Patchwork in Kuba cloth came about because of the softening process. The pounding would cause holes to develop in the cloth that would need to be repaired; thus patchwork would be used. To further enhance the look and to balance the visual effect, other patches of various geometric designs were added. Some dancing skirts can take up to two years before all the cloth needed to finish the skirt has been gathered. 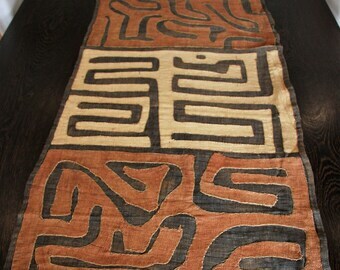 Love this Kuba Cloth. Great service. Well made and beautiful pillow cover is displayed prominently in a room filled with African artifacts. Although it took time to receive the product, it was packaged beautifully. I will purchase from this vendor, again. Very beautiful! I love my tapestry so much! Thanks to Guto for being so polite and attentive. I received my product in exactly 2 weeks here in USA Florida. My product arrived just as described. I will be ordering more. We accept payment via PayPal or any major credit card (Visa, MasterCard, American Express). You're welcome to return an item within 14 days of receipt, in the same condition you received it. Just let us know you're returning it. You may have either a credit or a refund for your purchase price, not including shipping both ways. We ship daily except weekends and holidays. Most orders go out the same day, and all go out within 48 hours. We ship internationally. We offer registered mail to most parts of the world. International customers, please note that we are required by law to state the true value of your merchandise on your customs forms and you may be required to pay additional customs fees or duties. Please note that standard delivery may take up to 30 days. Only then will orders be considered undelivered. If you have any question don't hesitate to reach out to me on augustomcunha@gmail.com.